The Holy Spirit (Greek: παράκλητος) is the third person of the Holy Trinity, both distinct and coequal with God the Father and the Son (Jesus). The Holy Spirit embodies the mutual eternal love of the Father and the Son. The Greek term for the Holy Spirit is "Paraclete", which means advocate or intercessor, thereby connoting a driving force for good. The Holy Spirit (Greek: παράκλητος) is the third person of the Holy Trinity, both distinct and coequal with God the Father and the Son (Jesus). The Holy Spirit embodies the mutual eternal love of the Father and the Son. The Greek term for the Holy Spirit is "Paraclete", which means advocate or intercessor, thereby connoting a driving force for good. * The Holy Spirit is the Third Person of the Blessed Trinity. * Though really distinct, as a Person, from the Father and the Son, He is consubstantial with Them; being God like Them, He possesses with Them one and the same Divine Essence or Nature. * He proceeds, not by way of generation, but by way of spiration, from the Father and the Son together, as from a single principle. In the New Testament the word spirit and, perhaps, even the expression spirit of God signify at times the soul or man himself, inasmuch as he is under the influence of God and aspires to things above; more frequently, especially in St. Paul, they signify God acting in man; but they are used, besides, to designate not only a working of God in general, but a Divine Person, Who is neither the Father nor the Son, Who is named together with the Father, or the Son, or with Both, without the context allowing them to be identified. A few instances are given here. We read in John 14:16-17: "And I will ask the Father, and he shall give you another Paraclete, that he may abide with, you for ever. The spirit of truth, whom the world cannot receive"; and in John 15:26: "But when the Paraclete cometh, whom I will send you from the Father, the Spirit of truth, who proceedeth from the Father, he shall give testimony of me." St. Peter addresses his first epistle, 1:1-2, "to the strangers dispersed . . . elect, according to the foreknowledge of God the Father, unto the sanctification of the Spirit, unto obedience and sprinkling of the blood of Jesus Christ". The Spirit of consolation and of truth is also clearly distinguished in John 16:7, 13-15, from the Son, from Whom He receives all He is to teach the Apostles, and from the Father, who has nothing that the Son also does not possess. Both send Him, but He is not separated from Them, for the Father and the Son come with Him when He descends into our souls (John 14:23). Many other texts declare quite as clearly that the Holy Spirit is a Person, a Person distinct from the Father and the Son, and yet One God with Them. In several places St. Paul speaks of Him as if speaking of God. In Acts 28:25, he says to the Jews: "Well did the Holy Spirit speak to our fathers by Isaias the prophet"; now the prophecy contained in the next two verses is taken from Isaiah 6:9-10, where it is put in the mouth of the "King the Lord of hosts". In other places he uses the words God and Holy Spirit as plainly synonymous. Thus he writes (1 Corinthians 3:16): "Know you not, that you are the temple of God, and that the Spirit of God dwelleth in you?" and in 6:19: "Or know you not, that your members are the temple of the Holy Spirit, who is in you . . . ?" St. Peter asserts the same identity when he thus remonstrates with Ananias (Acts 5:3-4): "Why hath Satan tempted thy heart, that thou shouldst lie to the Holy Spirit . . . ? Thou hast not lied to men, but to God." The sacred writers attribute to the Holy Spirit all the works characteristic of Divine power. 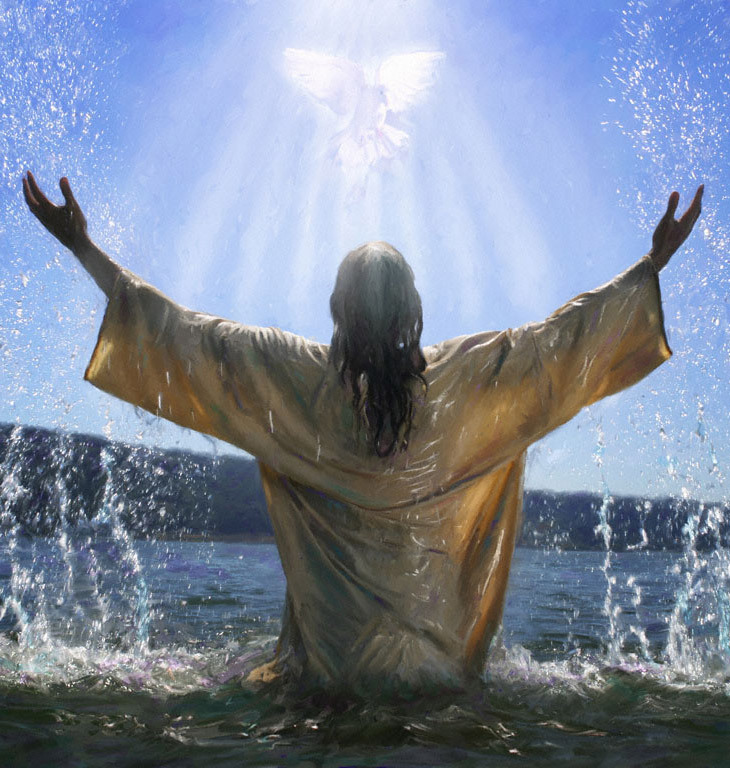 It is in His name, as in the name of the Father and of the Son, that baptism is to be given (Matthew 28:19). It is by His operation that the greatest of Divine mysteries, the Incarnation of the Word, is accomplished (Matthew 1:18, 20; Luke 1:35). It is also in His name and by His power that sins are forgiven and souls sanctified: "Receive ye the Holy Spirit. Whose sins you shall forgive, they are forgiven them" (John 20:22-23); "But you are washed, but you are sanctified, but you are justified in the name of our Lord Jesus Christ, and the Spirit of our God" (1 Corinthians 6:11); "The charity of God is poured forth in our hearts, by the Holy Spirit, who is given to us" (Romans 5:5). He is essentially the Spirit of truth (John 14:16-17; 15:26), Whose office it is to strengthen faith (Acts 6:5), to bestow wisdom (Acts 6:3), to give testimony of Christ, that is to say, to confirm His teaching inwardly (John 15:26), and to teach the Apostles the full meaning of it (John 14:26; 16:13). With these Apostles He will abide for ever (John 14:16). Having descended on them at Pentecost, He will guide them in their work (Acts 8:29), for He will inspire the new prophets (Acts 11:28; 13:9), as He inspired the Prophets of the Old Law (Acts 7:51). He is the source of graces and gifts (1 Corinthians 12:3-11); He, in particular, grants the gift of tongues (Acts 2:4; 10:44-47). And as he dwells in our bodies sanctifies them (1 Corinthians 3:16; 6:19), so will and them he raise them again, one day, from the dead (Romans 8:11). But he operates especially in the soul, giving it a new life (Romans 8:9 sq. ), being the pledge that God has given us that we are his children (Romans 8:14-16; 2 Corinthians 1:22; 5:5; Galatians 4:6). He is the Spirit of God, and at the same time the Spirit of Christ (Romans 8:9); because He is in God, He knows the deepest mysteries of God (1 Corinthians 2:10-11), and He possesses all knowledge. St. Paul ends his Second Epistle to the Corinthians (13:13) with this formula of benediction, which might be called a blessing of the Trinity: "The grace of our Lord Jesus Christ, and the charity of God, and the communication of the Holy Spirit be with you all." — Cf. Tixeront, "Hist. des dogmes", Paris, 1905, I, 80, 89, 90, 100, 101. While corroborating and explaining the testimony of Scripture, Tradition brings more clearly before us the various stages of the clarification of this doctrine. As early as the first century, St. Clement of Rome gives us important teaching about the Holy Spirit. His "Epistle to the Corinthians" not only tells us that the Spirit inspired and guided the holy writers (8.1; 45.2); that He is the voice of Jesus Christ speaking to us in the Old Testament (22.1 sq. ); but it contains further, two very explicit statements about the Trinity. In 46.6 (Funk, "Patres apostolici", 2nd ed., I,158), we read that "we have only one God, one Christ, one only Spirit of grace within us, one same vocation in Christ". In 58.2 (Funk, ibid., 172), the author makes this solemn affirmation; zo gar ho theos, kai zo ho kyrios Iesous Christos kai to pneuma to hagion, he te pistis kai he elpis ton eklekton, oti . . . which we may compare with the formula so frequently met with in the Old Testament: zo kyrios. From this it follows that, in Clement's view, kyrios was equally applicable to ho theos (the Father), ho kyrios Iesous Christos, and to pneuma to hagion; and that we have three witnesses of equal authority, whose Trinity, moreover, is the foundation of Christian faith and hope. The same doctrine is declared, in the second and third centuries, by the lips of the martyrs, and is found in the writings of the Fathers. St. Polycarp (d. 155), in his torments, thus professed his faith in the Three Adorable Persons ("Martyrium sancti Polycarpi" in Funk, op. cit., I, 330): "Lord God Almighty, Father of Thy blessed and well beloved Son, Jesus Christ . . . in everything I praise Thee, I bless Thee, I glorify Thee by the eternal and celestial pontiff Jesus Christ, Thy well beloved Son, by whom, to Thee, with Him and with the Holy Spirit, glory now and for ever!" St. Epipodius spoke more distinctly still (Ruinart, "Acta mart. ", Verona edition, p. 65): "I confess that Christ is God with the Father and the Holy Spirit, and it is fitting that I should give back my soul to Him Who is my Creator and my Redeemer." Among the apologists, Athenagoras mentions the Holy Spirit along with, and on the same plane as, the Father and the Son. "Who would not be astonished", says he (A Plea for the Christians 10), "to hear us called atheists, us who confess God the Father, God the Son and the Holy Spirit, and hold them one in power and distinct in order [. . . ten en te henosei dynamin, kai ten en te taxei diairesin]?" Theophilus of Antioch, who sometimes gives to the Holy Spirit, as to the Son, the name of Wisdom (sophia), mentions besides (To Autolycus I.7 and II.18) the three terms theos, logos, sophia and, being the first to apply the characteristic word that was afterwards adopted, says expressly (II.15) that they form a trinity (trias). Irenæus looks upon the Holy Spirit as eternal (Against Heresies V.12.2), existing in God ante omnem constitutionem, and produced by him at the beginning of His ways (IV.20.3). Considered with regard to the Father, the Holy Spirit is his wisdom (IV.20.3); the Son and He are the "two hands" by which God created man (IV.Preface.4, IV.20.20 and V.6.1). Considered with regard to the Church, the same Spirit is truth, grace, a pledge of immortality, a principle of union with God; intimately united to the Church, He gives the sacraments their efficacy and virtue (III.17.2, III.24.1, IV.33.7 and V.8.1). St. Hippolytus, though he does not speak at all clearly of the Holy Spirit regarded as a distinct person, supposes him, however, to be God, as well as the Father and the Son (Against Noetus 8, 12). Tertullian is one of the writers of this age whose tendency to Subordinationism is most apparent, and that in spite of his being the author of the definitive formula: "Three persons, one substance". And yet his teaching on the Holy Spirit is in every way remarkable. He seems to have been the first among the Fathers to affirm His Divinity in a clear and absolutely precise manner. In his work "Adversus Praxean" he dwells at length on the greatness of the Paraclete. The Holy Spirit, he says, is God (13); of the substance of the Father (3 and 4); one and the same God with the Father and the Son (2); proceeding from the Father through the Son (4, 8); teaching all truth (2). St. Gregory Thaumaturgus, or at least the Ekthesis tes pisteos, which is commonly attributed to him, and which dates from the period 260-270, gives us this remarkable passage (P.G., X, 933 sqq. ): "One is God, Father of the living Word, of the subsisting Wisdom. . . . One the Lord, one of one, God of God, invisible of invisible. . .One the Holy Spirit, having His subsistence from God. . . . Perfect Trinity, which in eternity, glory, and power, is neither divided, nor separated. . . . Unchanging and immutable Trinity." In 304, the martyr St. Vincent said (Ruinart, op. cit., 325): "I confess the Lord Jesus Christ, Son of the Father most High, one of one; I recognize Him as one God with the Father and the Holy Spirit." But we must come down towards the year 360 to find the doctrine on the Holy Spirit explained both fully and clearly. It is St. Athanasius who does so in his "Letters to Serapion" (P.G., XXVI, col. 525 sq.). He had been informed that certain Christians held that the Third Person of the Blessed Trinity was a creature. To refute them he questions the Scriptures, and they furnish him with arguments as solid as they are numerous. They tell him, in particular, that the Holy Spirit is united to the Son by relations just like those existing between the Son and the Father; that He is sent by the Son; that He is His mouth-piece and glorifies Him; that, unlike creatures, He has not been made out of nothing, but comes forth from God; that He performs a sanctifying work among men, of which no creature is capable; that in possessing Him we possess God; that the Father created everything by Him; that, in fine, He is immutable, has the attributes of immensity, oneness, and has a right to all the appellations that are used to express the dignity of the Son. Most of these conclusions he supports by means of Scriptural texts, a few from amongst which are given above. But the writer lays special stress on what is read in Matthew 28:19. "The Lord", he writes (Ad Serap., III, n. 6, in P.G., XXVI, 633 sq. ), "founded the Faith of the Church on the Trinity, when He said to His Apostles: 'Going therefore, teach ye all nations; baptizing them in the name of the Father, and of the Son, and of the Holy Spirit.' If the Holy Spirit were a creature, Christ would not have associated Him with the Father; He would have avoided making a heterogeneous Trinity, composed of unlike elements. What did God stand in need of? Did He need to join to Himself a being of different nature? . . . No, the Trinity is not composed of the Creator and the creature." A little later, St. Basil, Didymus of Alexandria, St. Epiphanius, St. Gregory of Nazianzus, St. Ambrose, and St. Gregory of Nyssa took up the same thesis ex professo, supporting it for the most part with the same proofs. All these writings had prepared the way for the Council of Constantinople which, in 381, condemned the Pneumatomachians and solemnly proclaimed the true doctrine. This teaching forms part of the Creed of Constantinople, as it is called, where the symbol refers to the Holy Spirit, "Who is also our Lord and Who gives life; Who proceeds from the Father, Who is adored and glorified together with the Father and the Son; Who spoke by the prophets". Was this creed, with these particular words, approved by the council of 381? Formerly that was the common opinion, and even in recent times it has been held by authorities like Hefele, Hergenröther, and Funk; other historians, amongst whom are Harnack and Duchesne, are of the contrary opinion; but all agree in admitting that the creed of which we are speaking was received and approved by the Council of Chalcedon, in 451, and that, at least from that time, it became the official formula of Catholic orthodoxy. We need not dwell at length on the precise meaning of the Procession in God. (See TRINITY.) It will suffice here to remark that by this word we mean the relation of origin that exists between one Divine Person and another, or between one and the two others as its principle of origin. The Son proceeds from the Father; the Holy Spirit proceeds from the Father and the Son. The latter truth will be specially treated here. (a) The Holy Spirit is called the Spirit of Christ (Romans 8:9), the Spirit of the Son (Galatians 4:6), the Spirit of Jesus (Acts 16:7). These terms imply a relation of the Spirit to the Son, which can only be a relation of origin. This conclusion is so much the more indisputable as all admit the similar argument to explain why the Holy Spirit is called the Spirit of the Father. Thus St. Augustine argues (Tractate 99 on the Gospel of John, nos. 6-7): "You hear the Lord himself declare: 'It is not you that speak, but the Spirit of your Father that speaketh in you'. Likewise you hear the Apostle declare: 'God hath sent the Spirit of His Son into your hearts. Could there then be two spirits, one the spirit of the Father, the other the spirit of the Son? Certainly not. Just as there is only one Father, just as there is only one Lord or one Son, so there is only one Spirit, Who is, consequently, the Spirit of both. . . Why then should you refuse to believe that He proceeds also from the Son, since He is also the Spirit of the Son? If He did not proceed from Him, Jesus, when He appeared to His disciples after His Resurrection, would not have breathed on them, saying: 'Receive ye the Holy Spirit'. What, indeed, does this breathing signify, but that the Spirit proceeds also from Him?" St. Athanasius had argued in exactly the same way (De Trinit. et Spir. S., n. 19, in P.G., XXVI, 1212), and concluded: "We say that the Son of God is also the source of the Spirit." This fact is undisputed as far as the Western Fathers are concerned; but the Greeks deny it in the case of the Easterns. We will cite, therefore, a few witnesses from among the latter. The testimony of St. Athanasius has been quoted above, to the effect that "the Son is the source of the Spirit", and the statement of Cyril of Alexandria that the Holy Spirit has His "nature" from the Son. The latter saint further asserts (Thesaur., assert. xxxiv in P.G., LXXV, 585); "When the Holy Spirit comes into our hearts, He makes us like to God, because He proceeds from the Father and the Son"; and again (Epist., xvii, Ad Nestorium, De excommunicatione in P.G., LXXVII, 117): "The Holy Spirit is not unconnected with the Son, for He is called the Spirit of Truth, and Christ is the Truth; so He proceeds from Him as well as from God the Father." St. Basil (On the Holy Spirit 18) wishes us not to depart from the traditional order in mentioning the Three Divine Persons, because "as the Son is to the Father, so is the Spirit to the Son, in accordance with the ancient order of the names in the formula of baptism". St. Epiphanius writes (Ancor., viii, in P.G., XLIII, 29, 30) that the Paraclete "is not to be considered as unconnected with the Father and the Son, for He is with Them one in substance and divinity", and states that "He is from the Father and the Son"; a little further, he adds (op. cit., xi, in P.G., XLIII, 35): "No one knows the Spirit, besides the Father, except the Son, from Whom He proceeds and of Whom He receives." Lastly, a council held at Seleucia in 410 proclaims its faith "in the Holy Living Spirit, the Holy Living Paraclete, Who proceeds from the Father and the Son" (Lamy, "Concilium Seleuciæ", Louvain, 1868). However, when we compare the Latin writers, as a body, with the Eastern writers, we notice a difference in language: while the former almost unanimously affirm that the Holy Spirit proceeds from the Father and from the Son, the latter generally say that He proceeds from the Father through the Son. In reality the thought expressed by both Greeks and Latins is one and the same, only the manner of expressing it is slightly different: the Greek formula ek tou patros dia tou ouiou expresses directly the order according to which the Father and the Son are the principle of the Holy Spirit, and implies their equality as principle; the Latin formula expresses directly this equality, and implies the order. As the Son Himself proceeds from the Father, it is from the Father that He receives, with everything else, the virtue that makes Him the principle of the Holy Spirit. Thus, the Father alone is principium absque principio, aitia anarchos prokatarktike, and, comparatively, the Son is an intermediate principle. The distinct use of the two prepositions, ek (from) and dia (through), implies nothing else. In the thirteenth and fourteenth centuries, the Greek theologians Blemmidus, Beccus, Calecas, and Bessarion called attention to this, explaining that the two particles have the same signification, but that from is better suited to the First Person, Who is the source of the others, and through to the Second Person, Who comes from the Father. Long before their time St. Basil had written (On the Holy Spirit 8.21): "The expression di ou expresses acknowledgment of the primordial principle [ tes prokatarktikes aitias]"; and St. Chrysostom (Homily 5 on the Gospel of John, no. 2): "If it be said through Him, it is said solely in order that no one may imagine that the Son is not generated": It may be added that the terminology used by the Eastern and Western writers, respectively, to express the idea is far from being invariable. Just as Cyril, Epiphanius, and other Greeks affirm the Procession ex utroque, so several Latin writers did not consider they were departing from the teaching of their Church in expressing themselves like the Greeks. Thus Tertullian (Against Praxeas 4): "Spiritum non aliunde puto quam a Patre per Filium"; and St. Hilary (On the Holy Trinity XII.57), addressing himself to the Father, protests that he wishes to adore, with Him and the Son "Thy Holy Spirit, Who comes from Thee through thy only Son". And yet the same writer had said, a little higher (op. cit., lib. II, 29, in P.L., X, 69), "that we must confess the Holy Spirit coming from the Father and the Son", a clear proof that the two formulæ were regarded as substantially equivalent. Proceeding both from the Father and the Son, the Holy Spirit, nevertheless, proceeds from Them as from a single principle. This truth is, at the very least insinuated in the passage of John 16:15 (cited above), where Christ establishes a necessary connection between His own sharing in all the Father has and the Procession of the Holy Spirit. Hence it follows, indeed, that the Holy Spirit proceeds from the two other Persons, not in so far as They are distinct, but inasmuch as Their Divine perfection is numerically one. Besides, such is the explicit teaching of ecclesiastical tradition, which is concisely put by St. Augustine (On the Holy Trinity V.14): "As the Father and the Son are only one God and, relatively to the creature, only one Creator and one Lord, so, relatively to the Holy Spirit, They are only one principle." This doctrine was defined in the following words by the Second Ecumenical Council of Lyons [Denzinger, "Enchiridion" (1908), n. 460]: "We confess that the Holy Spirit proceeds eternally from the Father and the Son, not as from two principles, but as from one principle, not by two spirations, but by one single spiration." The teaching was again laid down by the Council of Florence (ibid., n. 691), and by Eugene IV in his Bull "Cantate Domino" (ibid., n. 703 sq.). It is likewise an article of faith that the Holy Spirit does not proceed, like the Second Person of the Trinity, by way of generation. Not only is the Second Person alone called Son in the Scriptures, not only is He alone said to be begotten, but He is also called the only Son of God; the ancient symbol that bears the name of Saint Athanasius states expressly that "the Holy Spirit comes from the Father and from the Son not made, not created, not generated, but proceeding". As we are utterly incapable of otherwise fixing the meaning of the mysterious mode affecting this relation of origin, we apply to it the name spiration, the signification of which is principally negative and by way of contrast, in the sense that it affirms a Procession peculiar to the Holy Spirit and exclusive of filiation. But though we distinguish absolutely and essentially between generation and spiration, it is a very delicate and difficult task to say what the difference is. St. Thomas (I.27), following St. Augustine (On the Holy Trinity XV.27), finds the explanation and, as it the were, the epitome, of the doctrine in principle that, in God, the Son proceeds through the Intellect and the Holy Spirit through the Will. The Son is, in the language of Scripture, the image of the Invisible God, His Word, His uncreated wisdom. God contemplates Himself and knows Himself from all eternity, and, knowing Himself, He forms within Himself a substantial idea of Himself, and this substantial thought is His Word. Now every act of knowledge is accomplished by the production in the intellect of a representation of the object known; from this head, then the process offers a certain analogy with generation, which is the production by a living being of a being partaking of the same nature; and the analogy is only so much the more striking when there is question of this act of Divine knowledge, the eternal term of which is a substantial being, consubstantial within the knowing subject. As to the Holy Spirit, according to the common doctrine of theologians, He proceeds through the will. The Holy Spirit, as His name indicates, is Holy in virtue of His origin, His spiration; He comes therefore from a holy principle; now holiness resides in the will, as wisdom is in the intellect. That is also the reason why He is so often called par excellence, in the writings of the Fathers, Love and Charity. The Father and the Son love one another from all eternity, with a perfect ineffable love; the term of this infinite fruitful mutual love is Their Spirit Who is co-eternal and con-substantial with Them. Only, the Holy Spirit is not indebted to the manner of His Procession precisely for this perfect resemblance to His principle, in other words for His consubstantiality; for to will or love an object does not formally imply the production of its immanent image in the soul that loves, but rather a tendency, a movement of the will towards the thing loved, to be united to it and enjoy it. So, making every allowance for the feebleness of our intellects in knowing, and the unsuitability of our words for expressing the mysteries of the Divine life, if we can grasp how the word generation, freed from all the imperfections of the material order may be applied by analogy to the Procession of the Word, so we may see that the term can in no way befittingly applied to the Procession of the Holy Spirit. Having treated of the part taken by the Son in the Procession of the Holy Spirit, we come next to consider the introduction of the expression Filioque into the Creed of Constantinople. The author of the addition is unknown, but the first trace of it is found in Spain. The Filioque was successively introduced into the Symbol of the Council of Toledo in 447, then, in pursuance of an order of another synod held in the same place (589), it was inserted in the Niceno-Constantinopolitan Creed. Admitted likewise into the Symbol Quicumque, it began to appear in France in the eighth century. It was chanted in 767, in Charlemagne's chapel at Gentilly, where it was heard by ambassadors from Constantine Copronymnus. The Greeks were astonished and protested, explanations were given by the Latins, and many discussions followed. The Archbishop of Aquileia, Paulinus, defended the addition at the Council of Friuli, in 796. It was afterwards accepted by a council held at Aachen, in 809. However, as it proved a stumbling-block to the Greeks Pope Leo III disapproved of it; and, though he entirely agreed with the Franks on the question of the doctrine, he advised them to omit the new word. He himself caused two large silver tablets, on which the creed with the disputed expression omitted was engraved to be erected in St. Peter's. His advice was unheeded by the Franks; and, as the conduct and schism of Photius seemed to justify the Westerns in paying no more regard to the feelings of the Greeks, the addition of the words was accepted by the Roman Church under Benedict VIII (cf. Funk, "Kirchengeschichte", Paderborn, 1902, p. 243). The Greeks have always blamed the Latins for making the addition. They considered that, quite apart from the question of doctrine involved by the expression, the insertion was made in violation of a decree of the Council of Ephesus, forbidding anyone "to produce, write, or compose a confession of faith other than the one defined by the Fathers of Nicæa". Such a reason will not bear examination. Supposing the truth of the dogma (established above), it is inadmissible that the Church could or would have deprived herself of the right to mention it in the symbol. If the opinion be adhered to, and it has strong arguments to support it, which considers that the developments of the Creed in what concerns the Holy Spirit were approved by the Council of Constantinople (381), at once it might be laid down that the bishops at Ephesus (431) certainly did not think of condemning or blaming those of Constantinople. But, from the fact that the disputed expression was authorized by the Council of Chalcedon, in 451, we conclude that the prohibition of the Council of Ephesus was never understood, and ought not to be understood, in an absolute sense. It may be considered either as a doctrinal, or as a merely disciplinary pronouncement. In the first case it would exclude any addition or modification opposed to, or at variance with, the deposit of Revelation; and such seems to be its historic import, for it was proposed and accepted by the Fathers to oppose a formula tainted with Nestorianism. In the second case considered as a disciplinary measure, it can bind only those who are not the depositaries of the supreme power in the Church. The latter, as it is their duty to teach the revealed truth and to preserve it from error, possess, by Divine authority, the power and right to draw up and propose to the faithful such confessions of faith as circumstances may demand. This right is as unconfinable as it is inalienable. This title and the theory connected with it, like the theory of the fruits of the Holy Spirit and that of the sins against the Holy Spirit, imply what theologians call appropriation. By this term is meant attributing especially to one Divine Person perfections and exterior works which seem to us more clearly or more immediately to be connected with Him, when we consider His personal characteristics, but which in reality are common to the Three Persons. It is in this sense that we attribute to the Father the perfection of omnipotence, with its most striking manifestations, e.g. the Creation, because He is the principle of the two other Persons; to the Son we attribute wisdom and the works of wisdom, because He proceeds from the Father by the Intellect; to the Holy Spirit we attribute the operations of grace and the sanctification of souls, and in particular spiritual gifts and fruits, because He proceeds from the Father and the Son as Their mutual love and is called in Holy Writ the goodness and the charity of God. The gifts of the Holy Spirit are of two kinds: the first are specially intended for the sanctification of the person who receives them; the second, more properly called charismata, are extraordinary favours granted for the help of another, favours, too, which do not sanctify by themselves, and may even be separated from sanctifying grace. Those of the first class are accounted seven in number, as enumerated by Isaias (11:2-3), where the prophet sees and describes them in the Messias. They are the gifts of wisdom, understanding, counsel, fortitude, knowledge, piety (godliness), and fear of the Lord. * The gift of wisdom, by detaching us from the world, makes us relish and love only the things of heaven. * The gift of understanding helps us to grasp the truths of religion as far as is necessary. * The gift of counsel springs from supernatural prudence, and enables us to see and choose correctly what will help most to the glory of God and our own salvation. * By the gift of fortitude we receive courage to overcome the obstacles and difficulties that arise in the practice of our religious duties. * The gift of knowledge points out to us the path to follow and the dangers to avoid in order to reach heaven. * The gift of piety, by inspiring us with a tender and filial confidence in God, makes us joyfully embrace all that pertains to His service. * Lastly, the gift of fear fills us with a sovereign respect for God, and makes us dread, above all things, to offend Him. As to the inner nature of these gifts, theologians consider them to be supernatural and permanent qualities, which make us attentive to the voice of God, which render us susceptible to the workings of actual grace, which make us love the things of God, and, consequently, render us more obedient and docile to the inspirations of the Holy Spirit. But how do they differ from the virtues? Some writers think they are not really distinct from them, that they are the virtues inasmuch as the latter are free gifts of God, and that they are identified essentially with grace, charity, and the virtues. That opinion has the particular merit of avoiding a multiplication of the entities infused into the soul. Other writers look upon the gifts as perfections of a higher order than the virtues; the latter, they say, dispose us to follow the impulse and guidance of reason; the former are functionally intended to render the will obedient and docile to the inspirations of the Holy Spirit. For the former opinion, see Bellevüe, "L'uvre du Saint-Esprit" (Paris, 1902), 99 sq. ; and for the latter, see St. Thomas, I-II.68.1, and Froget, "De l'habitation du Saint-Esprit dans les âmes justes" (Paris, 1900), 378 sq. The gifts of the second class, or charismata, are known to us partly from St. Paul, and partly from the history of the primitive Church, in the bosom of which God plentifully bestowed them. Of these "manifestations of the Spirit", "all these things [that] one and the same Spirit worketh, dividing to every one according as he will", the Apostle speaks to us, particularly in 1 Corinthians 12:6-11 and 12:28-31; and Romans 12:6-8. * Two charismata which regard the teaching of Divine things: sermo sapientiæ, sermo scientiæ, the former relating to the exposition of the higher mysteries, the latter to the body of Christian truths. * Three charismata that lend support to this teaching: fides, gratia sanitatum, operatio virtutum. The faith here spoken of is faith in the sense used by Matthew 17:19: that which works wonders; so it is, as it were, a condition and a part of the two gifts mentioned with it. * Four charismata that served to edify, exhort, and encourage the faithful, and to confound the unbelievers: prophetia, discretio spirituum, genera linguarum, interpretatio sermonum. These four seem to fall logically into two groups; for prophecy, which is essentially inspired pronouncement on different religious subjects, the declaration of the future being only of secondary import, finds its complement and, as it were, its check in the gift of discerning spirits; and what, as a rule, would be the use of glossololia — the gift of speaking with tongues — if the gift of interpreting them were wanting? * Lastly there remain the charismata that seem to have as object the administration of temporal affairs, amid works of charity: gubernationes, opitulationes, distributiones. Judging by the context, these gifts, though conferred and useful for the direction and comfort of one's neighbour, were in no way necessarily found in all ecclesiastical superiors. The charismata, being extraordinary favours and not requisite for the sanctification of the individual, were not bestowed indiscriminately on all Christians. However, in the Apostolic Age, they were comparatively common, especially in the communities of Jerusalem, Rome, and Corinth. The reason of this is apparent: in the infant Churches the charismata were extremely useful, and even morally necessary, to strengthen the faith of believers, to confound the infidels, to make them reflect, and to counterbalance the false miracles with which they sometimes prevailed. St. Paul was careful (1 Corinthians 12-14) to restrict authoritatively the use of these charismata within the ends for which they were bestowed, and thus insist upon their subordination to the power of the hierarchy. Cf. Batiffol, "L'Église naissante et le catholicisme" (Paris, 1909), 36. Some writers extend this term to all the supernatural virtues, or rather to the acts of all these virtues, inasmuch as they are the results of the mysterious workings of the Holy Spirit in our souls by means of His grace. But, with St. Thomas, I-II.70.2, the word is ordinarily restricted to mean only those supernatural works that are done joyfully and with peace of soul. This is the sense in which most authorities apply the term to the list mentioned by St. Paul (Galatians 5:22-23): "But the fruit of the Spirit is, charity, joy, peace, patience, benignity, goodness, longanimity, mildness, faith, modesty, continency, chastity." Moreover, there is no doubt that this list of twelve — three of the twelve are omitted in several Greek and Latin manuscripts — is not to be taken in a strictly limited sense, but, according to the rules of Scriptural language, as capable of being extended to include all acts of a similar character. That is why the Angelic Doctor says: "Every virtuous act which man performs with pleasure is a fruit." The fruits of the Holy Spirit are not habits, permanent qualities, but acts. They cannot, therefore, be confounded with the virtues and the gifts, from which they are distinguished as the effect is from its cause, or the stream from its source. The charity, patience, mildness, etc., of which the Apostle speaks in this passage, are not then the virtues themselves, but rather their acts or operations; for, however perfect the virtues may be, they cannot be considered as the ultimate effects of grace, being themselves intended, inasmuch as they are active principles, to produce something else, i.e. their acts. Further, in order that these acts may fully justify their metaphorical name of fruits, they must belong to that class which are performed with ease and pleasure; in other words, the difficulty involved in performing them must disappear in presence of the delight and satisfaction resulting from the good accomplished. The sin or blasphemy against the Holy Spirit is mentioned in Matthew 12:22-32; Mark 3:22-30; Luke 12:10 (cf. 11:14-23); and Christ everywhere declares that it shall not be pardoned. In what does it consist? If we examine all the passages alluded to, there can be little doubt as to the reply. Let us take, for instance, the account given by St. Matthew which is more complete than that of the other Synoptics. There had been brought to Christ "one possessed with a devil, blind and dumb: and he healed him, so that he spoke and saw". While the crowd is wondering, and asking: "Is not this the Son of David? ", the Pharisees, yielding to their wonted jealousy, and shutting their eyes to the light of evidence, say: "This man casteth not out devils but by Beelzebub the prince of the devils." Jesus then proves to them this absurdity, and, consequently, the malice of their explanation; He shows them that it is by "the Spirit of God" that He casts out devils, and then He concludes: "therefore I say to you: Every sin and blasphemy shall be forgiven men, but the blasphemy of the Spirit shall not be forgiven. And whosoever shall speak a word against the Son of man, it shall be forgiven him: but he that shall speak against the Holy Spirit, it shall not he forgiven him, neither in this world, nor in the world to come." So, to sin against the Holy Spirit is to confound Him with the spirit of evil, it is to deny, from pure malice, the Divine character of works manifestly Divine. This is the sense in which St. Mark also defines the sin question; for, after reciting the words of the Master: "But he that shall blaspheme against the Holy Spirit shall never have forgiveness", he adds at once: "Because they said: He hath an unclean spirit." With this sin of pure downright malice, Jesus contrasts the sin "against the Son of man", that is the sin committed against Himself as man, the wrong done to His humanity in judging Him by His humble and lowly appearance. This fault, unlike the former, might he excused as the result of man's ignorance and misunderstanding. St. Thomas, whom we may safely follow, gives a very good summary of opinions in II-II.14. He says that blasphemy against the Holy Spirit was and may be explained in three ways. * Sometimes, and in its most literal signification, it has been taken to mean the uttering of an insult against the Divine Spirit, applying the appellation either to the Holy Spirit or to all three Divine persons. This was the sin of the Pharisees, who spoke at first against "the Son of Man", criticizing the works and human ways of Jesus, accusing Him of loving good cheer and wine, of associating with the publicans, and who, later on, with undoubted bad faith, traduced His Divine works, the miracles which He wrought by virtue of His own Divinity. * On the other hand, St. Augustine frequently explains blasphemy against the Holy Spirit to be final impenitence, perseverance till death in mortal sin. This impenitence is against the Holy Spirit, in the sense that it frustrates and is absolutely opposed to the remission of sins, and this remission is appropriated to the Holy Spirit, the mutual love of the Father and the Son. In this view, Jesus, in Matthew 12 and Mark 3 did not really accuse the Pharisees of blaspheming the Holy Spirit, He only warned them against the danger they were in of doing so. * Finally, several Fathers, and after them, many scholastic theologians, apply the expression to all sins directly opposed to that quality which is, by appropriation, the characteristic quality of the Third Divine Person. Charity and goodness are especially attributed to the Holy Spirit, as power is to the Father and wisdom to the Son. Just, then, as they termed sins against the Father those that resulted from frailty, and sins against the Son those that sprang from ignorance, so the sins against the Holy Spirit are those that are committed from downright malice, either by despising or rejecting the inspirations and impulses which, having been stirred in man's soul by the Holy Spirit, would turn him away or deliver him from evil. The sins against the Holy Spirit are said to be unpardonable, but the meaning of this assertion will vary very much according to which of the three explanations given above is accepted. As to final impenitence it is absolute; and this is easily understood, for even God cannot pardon where there is no repentance, and the moment of death is the fatal instant after which no mortal sin is remitted. It was because St. Augustine considered Christ's words to imply absolute unpardonableness that he held the sin against the Holy Spirit to be solely final impenitence. In the other two explanations, according to St. Thomas, the sin against the Holy Spirit is remissable — not absolutely and always, but inasmuch as (considered in itself) it has not the claims and extenuating circumstance, inclining towards a pardon, that might be alleged in the case of sins of weakness and ignorance. He who, from pure and deliberate malice, refuses to recognize the manifest work of God, or rejects the necessary means of salvation, acts exactly like a sick man who not only refuses all medicine and all food, but who does all in his power to increase his illness, and whose malady becomes incurable, due to his own action. It is true, that in either case, God could, by a miracle, overcome the evil; He could, by His omnipotent intervention, either nullify the natural causes of bodily death, or radically change the will of the stubborn sinner; but such intervention is not in accordance with His ordinary providence; and if he allows the secondary causes to act, if He offers the free human will of ordinary but sufficient grace, who shall seek cause of complaint? In a word, the irremissableness of the sins against the Holy Spirit is exclusively on the part of the sinner, on account of the sinner's act.